It’s no mystery that there are toxic chemicals in conventional cleaning products – you can usually tell just from smelling them! So what are the alternatives? You can purchase green cleaning products, but if you’re on a budget and don’t mind spending a few minutes to DIY, you can save a lot of money by making them yourself. The Queen of Green has some easy Green Cleaning Recipes you can download here, which have been provided as bottle labels to all the families I’m coaching for the Queen of Green Coaching project. I’m posting some of my favourite recipes from her list, as well as from other sources in the blogosphere, to make a nice compilation of recipes. If you’ve started moving away from plastic for food storage, it might be something to think about for your cleaning products as well, especially if there are essential oils involved. Why use essential oils in cleaning products? Many have disinfecting properties, so they are powerful natural cleaning agents. However, essential oils tend to break down plastic, so glass is really the safest container for them. If you’re going to DIY some of your own cleaning products, it’s really easy to switch out a spray lid from an old plastic bottle and use it on an empty glass bottle (e.g. vinegar bottle) – check it out on mommypotamus. If you don’t have any that fit, you can turn a glass mason jar into a spray bottle with this cool sprayer cap! Mix ingredients together and pour into a spray bottle. Make sure you shake well when you use it – ingredients will settle. Also, keep out of the sun as essential oils oxidize in sunlight. Mix ingredients together in a spray bottle. Use on glass or mirrors with a dry cloth. If you’re trying to get rid of stubborn soap scum in the bathtub or shower, try this recipe from wellness mama – all you need is baking soda, salt, and borax. Sprinkle baking soda on the area, scrub, then rinse. Other alternatives: vinegar or salt. This is a huge problem in my house as our city has hard water. Just try soaking a towel in vinegar and wrap it around the faucet. Let it sit for several hours. This post has great advice for steam cleaning your carpets without chemicals. Instead, it uses vinegar, salt, baking soda, and borax. This post from The Humbled Homemaker has a tutorial on getting out a set-in stain in carpet by looking for the best carpet stain remover to help get rid of them. For a really comprehensive guide on cleaning carpets, check out The Definitive Guide to Carpet Cleaning. If you happen to get crayon on stuff (I mean, if your CHILD happens to get crayon on something), Lemon essential oil works to get it off, as described by The Prairie Homestead. Keeper of the Home has a MASSIVE list of 67 DIY natural cleaning recipes! If you don’t always want to be mixing your own stuff, another awesome green alternative is Young Living’s Thieves household cleaner (using their proprietary Thieves essential oil blend). It comes in a concentrate, so you only need to use a tiny amount in a spray bottle and fill the rest with water. Super easy and effective! What about your LAUNDRY routine? 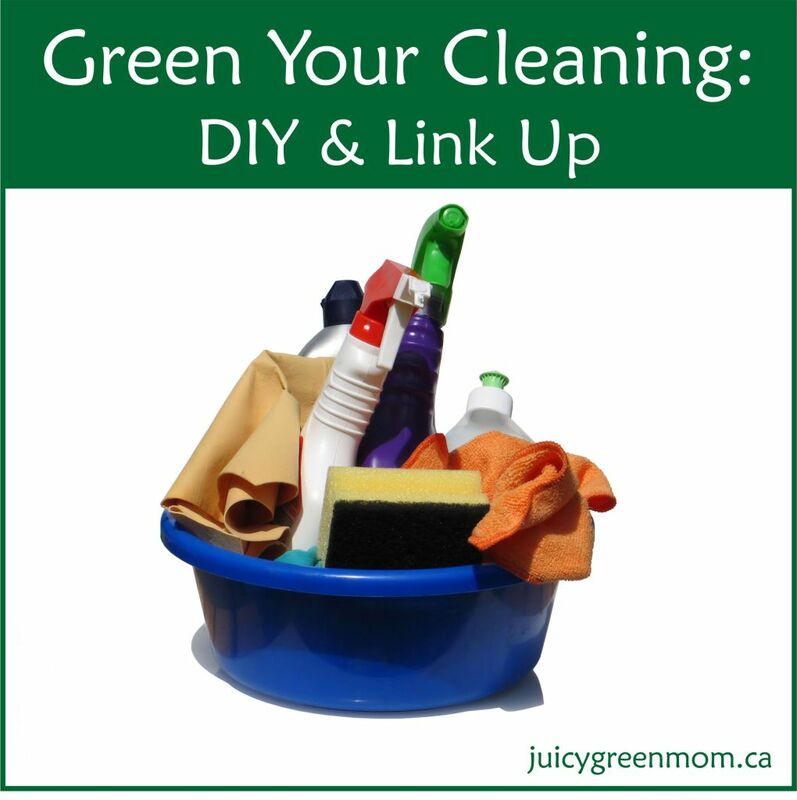 Check out my post for tips on Greening Your Laundry.